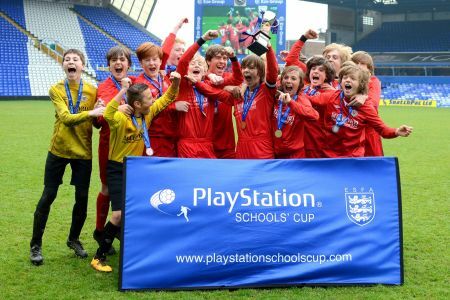 The ESFA PlayStation Schools’ Cup U13 IAT final was the penultimate match held at Birmingham City FC over the three days of finals at St Andrew’s Stadium. 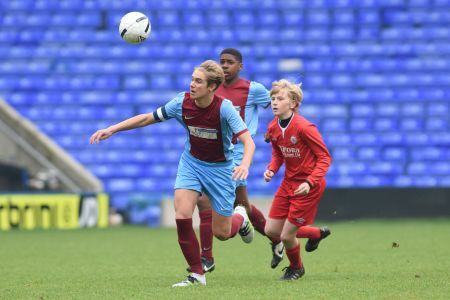 Chelmsford and Mid Essex v Liverpool were given the 12pm KO on the day to contest the coveted title. The game started off strongly by Chelmsford. An early shot by Stagg was taken inside the box and struck against the cross bar to deny an early goal in the game. After 7 minutes of the game, Liverpool thought they had scored the opening goal only to be denied by the referee for handball as the striker controlled the ball. Liverpool looked a good side on the attack, taking the ball up field in numbers against the Chelmsford defence. Half way through the first half and Chelmsford had a great effort. The ball was crossed into the danger area but was headed just wide of the post. 22 minutes into the match and we had the first goal. 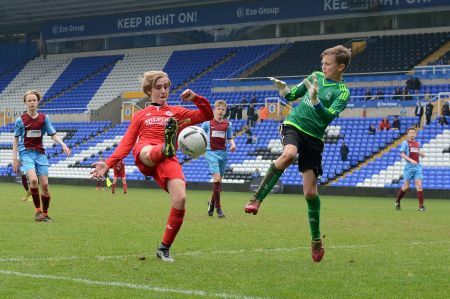 Scored by Tom Stagg of Chelmsford, the ball was crossed in from the right hand side and found its way through to Stagg who stuck out a foot to deflect the ball into the goal. Liverpool could have been straight back in the game with an attack on the Chelmsford goal, but the number of defending players proved difficult for Liverpool to break down. A few half chances feel to both teams before half time but none to trouble the respective goal keepers. Liverpool started the second half strong with 3 early chances but all comfortably saved by the Chelmsford goal keeper. Chelmsford looked to double their lead but the glove of the Liverpool keeper denied them the chance. The ball was struck well inside the area but is pushed past the goal post for a corner, which was cleared. Liverpool should have been back on level terms with 15 minutes to go. A corner put in from the right managed to hit the bar, bouncing down to the Liverpool attack with 2 chances, but the keeper keeps Chelmsford in the lead. With 4 minutes to go Liverpool force their way through the defence and earned themselves a corner. This is defended well by Chelmsford allowing them to counter attack. They chose to run the clock down instead of trying to add to their lead. 3 minutes added time was indicated and Liverpool finally got the goal they were looking for. A great effort by Williams saw him giving the ball inside the penalty area and had so much time to decide where he wanted to place the ball. Extra time began and Chelmsford hit the bar after just one minute. A free kick if floated in from 35 yards and looped over all of the players, only to drop down and hit the bar. Liverpool kept the pressure on with Williams striking hard but the Chelmsford keeper makes the save. This sent the game into penalties as neither team could get the deciding goal. Chelmsford: Zanda Siziba, Todd Miller, Kai Corbett. Liverpool: Corey Brennan, Joseph Wright, Ethan Gouldbourne, Finlay Armstrong. The Liverpool team rushed at the goal keeper to celebrate them winning the match. 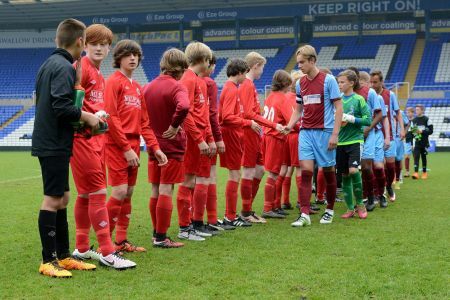 Both teams were awarded their medals and the Liverpool captain lifted the trophy to crown them as National Champions. 1. Scott Allison 2. Ethan Downham 3. Tommy Lambourne 4. Sidney Morgan 5. Harrison Bailey 6. Billy Chillcott 7. Kai Corbett 8. Zanda Siziba 9. Tom Stagg (Captain) 10. Jayden Février 11. Todd Miller 12. Adrian Hoxha 13. Jamie Grossart 14. Ola Bello 15. Henry Paul 16. Ali Mclachlan. 1. James Hardy 2. Thomas Ronan 3. Michael Cringle 4. Ethan Gouldbourne 5. Finlay Armstrong 6. Stephen Rawlings 7. Corey Brennan (Captain) 8. David Gardner 9. Joseph Ashley 10. Morgan Kinsella 12. Jake Rooney 13. Owen Mooney 16. Adam Woods 17. Jack Williams 18. Joseph Wright 19. Tom Costello 20. Alfie Wareing. Photos from the game are available from 353 Photography to view the album, please click here. A huge thanks to 247.tv for streaming the game live on our ESFA YouTube Channel. 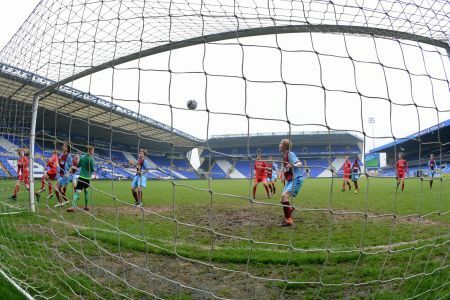 20th :: ESFA National Cup Competitions 2016/2017 – Entry Now Open!